Denton has been using a hybrid voting system that employs both electronic and paper ballots for about a decade. But county officials recently approved spending just shy of $9 million to buy new voting equipment from Austin-based Hart InterCivic that will return to an entirely paper-based system in time for this year’s November elections. Even disabled voters, who will cast their votes on touch-screen machines, will have their ballots printed out and tallied through a print scanner. The move comes months after a disastrous election day for Denton County in November, with machines inadvertently set to “test mode” instead of “election mode,” long lines, problems with scanning paper ballots, and, ultimately, incorrect tabulations. [Frank Phillips, Denton County’s elections administrator] — who was working in nearby Tarrant County at the time — said it was the personnel, not the machines, that caused chaos last fall. But voters in town, as well as leaders with the local Democratic and Republican parties, called for a return to paper ballots in the months following election day. And these aren’t just any paper ballots, Phillips emphasized. The new Hart system Denton purchased allows election administrators to print ballots on demand, eliminating the waste and cost of over-printing paper ballots in advance of an election and then having to expend resources storing those unused ballots afterward to comply with state regulations. It also prevents the problem of under-printing paper ballots — an issue that emerged last year when Titus County saw a higher-than-expected turnout for the presidential primary, and officials were forced to create and hand-count ballots on election day. I gather what this means is that when you show up, you will get a printed-for-you ballot, then (I presume) fill it out with a pen or pencil. It will then be read by an optical scanner to tally the votes. Which is fine, but it’s not the way I’d prefer it. The system they have for disabled voters, where you vote on a touch screen then have your ballot printed out, would be better. Frankly, having the vote recorded electronically then having a paper ballot that serves as your receipt is better still. This is basically what the STAR voter system that Travis County has been working on does. The main problem with filling out a paper ballot is that some people will fill it out incorrectly. Have you ever looked at the election returns on the Harris County Clerk website and wondered how there could possibly be overvotes in a race? It happens with the paper-based absentee ballots, where one can accidentally or purposefully select more than one candidate in a contest. Electronic voting machines don’t allow for this to happen. While this will almost always spoil a ballot for that race, some of the time with these overvotes, the voter’s intent is clear. In the infamous 2000 Florida election, some counties used a paper ballot with optical scan system, and there were documented instances of a person filling in the bubble for a specific candidate, then also putting that same candidate’s name in the write-in space. This is hardly an insurmountable problem, but it would help to have clear policies in place for when a ballot is truly spoiled and when a voter’s intent can be inferred. There are other potential issues here – do we have any idea if it will take people longer to vote on paper than on a screen, for instance – but again, I don’t think they’re insurmountable. I don’t care for the fearfulness behind the “how do I know that when I cast my ballot it’s recorded electronically?” premise – the same way you know that when you buy something from Amazon it will arrive on your doorstep and your credit card will get charged – but whatever. If this is what the people of Denton County want, then so be it. The Lewisville Texan has more. The Chron updates us on the latest in modern voting technology. The drumbeat of election rigging and foreign hacking of voting machines have energized ongoing efforts to develop a new model of digital election equipment designed to produce instantly verifiable results and dual records for security. Election experts say this emerging system, one of three publicly funded voting machine projects across the country, shows potential to help restore confidence in the country’s election infrastructure, most of which hasn’t been updated in more than a decade. A prototype of the system, dubbed STAR Vote, sits in an engineering lab at Rice University, and bidding is open for manufacturers who want to produce it wholesale. Similar efforts to innovate voting systems are in the works in Los Angeles and San Francisco. Like any aging digital device, the voting machines are eventually bound to stumble, said Lawrence Norden, deputy director of the Democracy Program at the Brennan Center for Justice. He pointed to Detroit, where the number of votes counted didn’t match the number of voters who signed in. And he noted that reports of machines flipping votes more likely result from aged touch screens than a conspiracy to rig the election. Yet there is seldom space in county budgets to replace the machines, which cost usually between $3,000 and $5,000 each. The vast majority of electronic voting equipment was purchased with federal funds from the Help America Vote Act of 2002. Most money reached the states by 2004, and there’s no foreseeable second wave of federal aid. STAR Vote runs automatic audits, comparing a statistical sample of the paper ballots with the digital records to verify results. “The savings are just enormous over doing a recount,” Stark said. While other systems allow for comparison of precinct-level data, STAR Vote can compare paper ballots with individual voters’ digital ballots, which are encrypted and posted online. Officials could take a small sample of printed ballots and compare them with digital results to conclude with high confidence that election results were correct. The system itself is also inexpensive, built with off-the-shelf tablet computers and printers, which Wallach said will cut the price down to half of the current norm. Advanced software makes up for the cheap hardware, designers said, and they plan to make the software open-source, meaning it is free to use and, unlike current systems, can be serviced by any provider without exclusive long-term contracts. I’ve written about this before, and while I love the design of the STAR machine, I don’t have much hope of getting to vote on one any time soon. The political climate just doesn’t seem conducive to any effort to improve the voting experience, and the lip service we got from Greg Abbott back during the peak Trump-whining-about-rigged-elections period has surely gone down the memory hole. The one possible way in that I can see for these devices is their lower cost. At some point, enough of the current voting machines will become sufficiently inoperable that replacement will be needed, and a cheaper device ought to have an advantage. Let’s hope the process of getting a manufacturer in place goes smoothly. Then this is what we should be talking about. [Travis] County Clerk Dana DeBeauvoir called Rice University computer science professor Dan Wallach, who has been poking holes in voting-machine security for years. He’s testified before Congress on the subject. Now DeBeauvoir wanted him to design a new one. The last time voting technology went through a major design change was after the disastrous Florida recount in the 2000 presidential election. Confusion over badly designed and incompletely punched paper ballots threw the results into chaos. In 2002, Congress passed the Help America Vote Act, committing $4 billion to help localities buy new electronic voting machines. But replacing them costs money that many localities don’t have, and it’s not clear that Congress will pony up again. So Wallach’s new system would have to be cheaper than what’s on the market now. The system that the team of cybersecurity and usability experts came up with is called STAR-Vote, for secure, transparent, auditable and reliable. It has two parts: A kiosk containing an off-the-shelf tablet computer and a standard inkjet printer, plus a metal ballot box with a built-in scanner. Off-the-shelf parts keep the cost down and can be easily sourced and replaced. Wallach says the metal box costs more than all the electronic components inside it. The whole system should cost half or less what current machines do, which cost about $3,000 each. Voters make their selections on the touchscreen tablet, which is kept off the internet and stripped of all software (and potential vulnerabilities) except the voting application. State-of-the-art cryptography protects the integrity of the vote. But it’s not the only safeguard. Hard copy remains one of the most secure ways to cast a ballot. Voters can see who the computer says they chose. The vote is only cast when the voter puts it in the ballot box. And if there is any question about the electronic votes, the paper ballots are the backup. This is nothing new – I wrote about it in July of 2014, and Wallach’s team made a presentation about STAR-Vote in August of 2013. The point is that this system, which is both more secure than what we have now while also being less expensive, could be in place for the 2018 election if we really wanted it to be. Given the lip service some Republicans like Greg Abbott are giving to election integrity, this is totally doable. You will know by what happens in the 2017 legislative session whether Abbott et al meant any of it or not. Wait, who supports paper ballots now? Following repeated allegations by Republican Donald Trump that the election may be rigged to ensure a win for Democrat Hillary Clinton, Texas lawmakers are actively considering ways to boost confidence in the state’s elections during next year’s legislative session. Among the ideas drawing interest: adding paper trail backups to thousands of electronic voting machines. The idea was brought up in a tweet Saturday by Gov. Greg Abbott. “That’s a great idea & we are considering it as an election reform measure. Election integrity is essential,” Abbott tweeted in response to a voter who tweeted that he wanted printed proof of how he cast his ballot. Over the last decade, several Texas lawmakers have filed bills to require paper trails on electronic voting machine. The proposals often include adding a printer in a sealed case to the state’s electronic voting machines so voters could check their votes against the receipt. The paper trail could be consulted in the event of a recount. During the 2007 legislative session, interest in the idea stalled following estimates that adding the printers to all of the state’s voting machines could cost $40 to 50 million, according to a Fort Worth Star-Telegram article from the time. One of the 2007 bills was authored by then-state Rep. Lois Kolkhorst, R-Brenham. Now a state senator, she said she may re-introduce her previous legislation. The move toward election reform comes amid an election season in which Texans have expressed concerns about election rigging and voter fraud. Last week, Trump highlighted reports of voting machines in Texas changing votes for president from voters casting straight-ticket ballots. Those reports, however, have been largely debunked by election officials, who have stated that alleged instances of “vote flipping” were the result of user error. 1. I’m old enough to remember when suspicion of electronic voting machines and faith that only paper ballots could ensure the integrity of our electoral system was a shibboleth on the left, largely having to do with dire conspiracy theories about the Diebold corporation and vote counting in Ohio in 2004. Here’s a little blast from the past for those of you who have blocked this out or weren’t there for it the first time. Who knew that a sociopathic sore-losing narcissist could spark such an interest in voting machine integrity among Republicans? For that matter, who knew that so many Republican voters could be that suspicious of the electoral process in a state whose elections they have been dominating for over 20 years? Clearly, all these Republican County Clerks and Republican-appointed elections administrators can’t be trusted. 2. Travis County has already done a lot of the heavy lifting on building a better mousetrap. Maybe we should just emulate their work and save us all a bunch of time and effort. 3. Putting aside the question of paper ballots for a moment, perhaps we should take a moment and contemplate the fact that the electronic voting machines we use now are all a decade or more old, and are generally past their recommended lifespan. If we do nothing else, spending a few bucks to upgrade and replace our current hardware would be an excellent investment. States have abandoned electronic voting machines in droves, ensuring that most voters will be casting their ballots by hand on Election Day. With many electronic voting machines more than a decade old, and states lacking the funding to repair or replace them, officials have opted to return to the pencil-and-paper voting that the new technology was supposed to replace. Nearly 70 percent of voters will be casting ballots by hand on Tuesday, according to Pamela Smith, president of election watchdog Verified Voting. “Paper, even though it sounds kind of old school, it actually has properties that serve the elections really well,” Smith said. It’s an outcome few would have predicted after the 2000 election, when the battle over “hanging chads” in the Florida recount spurred a massive, $3 billion federal investment in electronic voting machines. 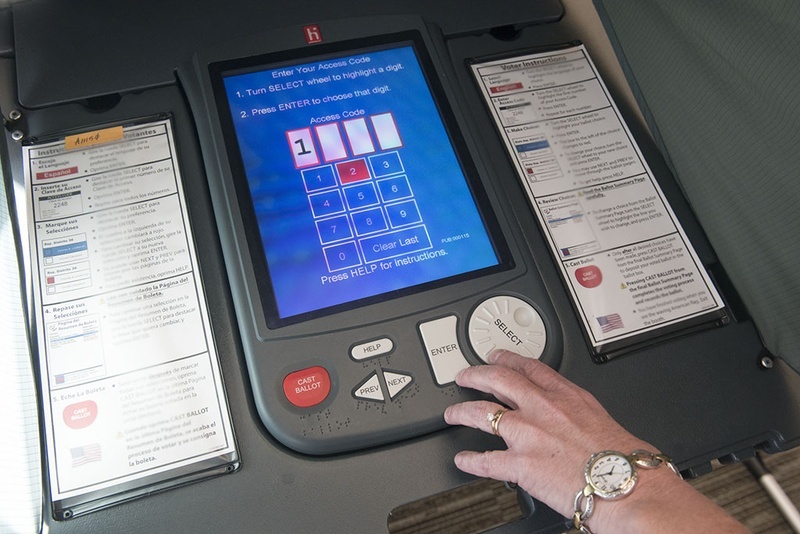 States at the time ditched punch cards and levers in favor of touch screens and ballot-scanners, with the perennial battleground state of Ohio spending $115 million alone on upgrades. Smith said the mid-2000s might go down as the “heyday” of electronic voting. Since then, states have failed to maintain the machines, partly due to budget shortfalls. “There is simply no money to replace them,” said Michael Shamos, a computer scientist at Carnegie Mellon University who has examined computerized voting systems in six states. The lack of spending on the machines is a major problem because the electronic equipment wears out quickly. Smith recalled sitting in a meeting with Missouri election officials in 2012, where they complained 25 percent of their equipment had malfunctioned in preelection testing. “You’re dealing with voting machines that are more than a decade old,” Smith said. Roughly half of the states that significantly adopted electronic voting following the cash influx have started to move toward paper. Shamos said he expects the move back to paper ballots to continue, unless there’s a high-profile crisis similar to the 2000 election. Still, he predicted the drumbeat for Internet and mobile voting will grow. “Eventually [a generation is] going to have the thought that it’s idiotic for me not to be able to vote using my cell phone,” Shamos said. No doubt. I can think of plenty of reasons for this, beyond the lack of money for new machines. There are the well-known security issues and accompanying mistrust of electronic voting machines, mostly coming from my side of the aisle. Some local officials are working on that, but the money issue is likely to be a formidable hurdle. Beyond that, there is the success that some states have had with voting by mail, plus the success we saw here in Texas in pushing absentee ballots. They’re convenient, they allow one to take one’s time, and they don’t require a photo ID. I have to wonder what the politics of expanding access to mail ballots would look like in the Lege this year, especially if a Democrat filed a bill to enable it. Might be worth watching. Mail ballots aren’t perfect – people who move frequently or who aren’t particularly fastidious about keeping track of their incoming mail may find them inconvenient – and it’s hard to see this as a step forward, even if it might help boost turnout. I think Professor Shamos is exactly right about how future generations will view a return to paper ballots. But until the killer voting app gets developed, this may be our best bet. Link via Ed Kilgore. When will we have truly electronic voting? When will there be an app to cast a vote in a US election? So at a time when we can see video shot by a robot on Mars, when there are cars that can drive themselves, and when we can deposit checks on our smartphones without going to a bank, why do most people still have to go to a polling place to vote? That’s because, security experts say, letting people vote through their phones or computers could have disastrous consequences. Ms. Simons then ran through a list of calamitous events that could occur if we voted by Internet. Viruses could be used to take over voters’ phones; rogue countries like Iran could commandeer computers and change results without our knowledge; government insiders could write software that decides who wins; denial-of-service attacks could take down the Internet on Election Day. Ronald L. Rivest, a computer scientist at the Massachusetts Institute of Technology, said that for now, the best technology out there is the one we’ve been using. Mr. Rivest, who is the R in the name of the RSA encryption system, which is used by government institutions and banks, said that if things went wrong on Election Day, chaos could ensue, because doubts about the results would rattle the foundations of our democracy. Voting by mail, which some cite as an option, lets people avoid the lines, but it is not so easy on the vote counters. In states where this is allowed, envelopes have to be opened and ballots sorted into precincts. Then the signature needs to be matched with that on the voter registration card. None of this is terribly efficient. So in 10, 20 or 100 years, when our cars have been replaced with self-flying spaceships, robots take our children to school, and our smartphones are chips in our heads, will we still be using a pen and paper to choose our president? I sure hope not. I presume the people who object to early voting are sputtering incoherently about now. There’s a fundamental tradeoff in the computing world between convenience and security. That which is more convenient is inherently less secure, and vice versa. I would not be so arrogant as to contradict Simons or Rivest on the concerns about conducting an election over the Internet or via smartphone. But I have a real hard time believing that forty years from now when my daughters are my age that they’ll be voting by the same means I do today. What do you think? This came out late Friday. Dealing a blow to critics of electronic voting machines, the Texas Supreme Court on Friday dismissed a case brought by Travis County voters that alleged the machines were not secure or reliable. The machines “are not perfect. No voting system is,” Chief Justice Wallace Jefferson said in his opinion. But “we cannot say that (electronic voting machines) impose severe restrictions on voters, particularly in light of the significant benefits such machines offer,” he said. The lawsuit, filed in 2006 but held up on procedural questions, sought to force Travis County to provide voters with a paper copy of their just-cast ballot to review for accuracy. That ballot would then be submitted to create a record that could be checked in event of a recount or problem with a machine. The current system, which tabulates all votes cast on a machine but does not provide printed ballots, cannot ensure accuracy or provide a backstop to a voting system that has had problems in the past, the voters said in the suit. Lawyers for Secretary of State Hope Andrade, the defendant in the case because she had certified the machines, argued the voters cannot show they have been harmed by the voting machines and therefore had no standing to sue. Although the court held they had standing on some issues, it ultimately found that the machines did not unduly impinge on the right to cast a ballot. Andrade “made a reasonable, nondiscriminatory choice to certify” the machines, Jefferson wrote. Friday’s decision reverses opinions by the state District Court in Travis County and the 3rd Court of Appeals , which had ruled that the lawsuit could proceed to trial. So five years after the lawsuit was filed, the Court has ultimately ruled that the lawsuit cannot be heard. I’m not a voting machine conspiracy theorist, but I would have liked to have seen their evidence presented in a courtroom. Guess that’s not going to happen. Questions and concerns about electronic voting machines have been around as long as the machines themselves. There have been numerous instances of weird happenings, but so far nothing catastrophic. At least, nothing that we know of. I believe electronic voting machines are an improvement over what we used to have, and I don’t think paper ballots are a panacea, but the system could definitely do with some redundancy. As noted later in the story, many counties will be replacing their voting equipment, as the current machines are at the end of their life cycle. Which means that now would be an excellent time to push your county clerk or elections administrator to include requiring a paper component for the new machines. You’re not going to get any relief from the courts, that’s for sure. Houston, TX– As usual, on General Election Day, Tuesday, Nov. 2, 2010, the eSlate electronic voting system will be the principal method of voting in Harris County. According to the County Clerk’s office, the deployment of electronic voting equipment will be virtually the same for this election compared to the last gubernatorial election. ”There will be enough electronic voting equipment at the polls to handle the expected Election Day turnout”, said Beverly Kaufman, the chief election official of the county. “Paper ballots will be available at every poll. But I strongly urge voters to cast their ballots using the eSlate electronic voting machines as it is the system which is most familiar to them.” The eSlate has been in use in Harris County since 2002. The Election Day infrastructure and procedures will also be the same as the previous similar election: There will be 736 polling locations, five more than four years ago; The polls will be open from 7 a.m. to 7 p.m.; And, a voter may bring someone of their choosing to the polling place to provide assistance, provided it is not their labor union representative, employer, an agent of their employer, or an officer or agent of a labor union to which the voter belongs. The person providing assistance must sign the Affidavit of Voter Assistance and print his/her name on the poll list, to attest to the fact that they will not unduly influence the voter. However, voters and the media will notice slight differences on Tuesday: Aside from the voters and the election clerks, there may be state and federal inspectors and poll watchers at some polls. [A Poll Watchers is a person appointed to observe the conduct of an election on behalf of a candidate, a political party, or the proponents or opponents of a measure (specific-purpose political action committees). The role of a poll watcher is to ensure the conduct of fair and honest elections]; and, the election night Central Counting Station will be at Reliant Arena. Aside from the federal, state and county races on the ballot, some voters may see other items at the end their ballot such as a proposition or non-partisan election. To vote, a person may present one of the following documents: a voter registration card, a driver’s license, a picture identification of any kind, a birth certificate, a U.S. Citizenship or Naturalization certificate, a U.S passport, a copy of a current utility bill, bank statement, government check, paycheck, or other government document that shows the name and address of the voter. Voters who registered by mail and did not provide their driver’s license number or identification number will also need to provide another form of identification other than the voter registration certificate. On Election Day, Texas law requires voters to vote at the precinct where they are registered to vote. Voters may find their election day polling location by visiting www.harrisvotes.com or calling 713 755 6965. Harris County Election Night returns may be slower in coming this year due to extra administrative procedures presiding election judges have to perform related to the possible use of paper ballots and because there will be only one central drop off location. “The pace of the election returns will be dictated by how fast election judges complete their paper work and close down their polling location, and the sites’ proximity to the central drop-off station”, said Harris County Clerk Beverly Kaufman, the chief elections officer of the county. The County Clerk Office expects to release the initial election results report approximately at 7:00 p.m. on election night. The report will include the ballots cast during the early voting period and almost all mail ballots delivered to the County Clerk by the election night deadline. As of the close of the early voting period, including absentee ballots, 444,648 persons had been processed to vote. It is estimated that almost 60 percent of all voters who will participate in this election may have voted before General Election Day. The Harris County Election Night Central Drop-Off and Counting Station will be at Reliant Arena Hall D, Reliant Park. Media may park live trucks in the Drive Lane of Maroon Lot 15, in front of Reliant Arena Hall A. Election work areas in Hall D will be off limits to the media. There will be a designated media room and media work area. As noted before, the prediction of 60% total early vote corresponds with a final turnout projection of about 750,000. I think that’s high, but we’re in uncharted waters, so who knows what could happen. I still expect the upper limit is more like 700,000, but we’ll know soon enough. In any event, today is the day we’ve been waiting for. Vote if you have not done so, and ensure your right to complain about the outcome afterward. I’ll be back later with updates and analysis. One reason why Harris County will make paper ballots available to anyone who wants them this year is because Beverly Kaufman is afraid we won’t get enough replacement voting machines in time for the election. The urgent tone of Kaufman’s request for loaner machines from other counties contrasts with her calm assurances to the public. Even as the fire still burned, she asserted that voting will remain as convenient as ever. The language of the letter to elections officials across the state is meant to communicate a serious situation, not a hopeless one, Kaufman said. “We needed to impress upon people that we need their help,” she said. Harris County Republican Party Chairman Jared Woodfill said he understands that Kaufman is operating under challenging conditions, but that the party prefers to use electronic voting as much as possible. A hybrid system also would necessitate the re-training of election judges and poll watchers, he said. The county’s Democratic Party actually recommended a hybrid election day voting system, said Chairman Gerry Birnberg. Paper ballots are less vulnerable to fraud, Birnberg said. I actually agree with Woodfill about the greater potential for fraud with paper ballots. It’s what we see today, as the vast majority of voter fraud investigations, including all of the ones that AG Greg Abbott prosecuted in his million-dollar effort to combat the “epidemic” of voter fraud he believed was happening, involved paper absentee ballots. The irony of all this, of course, is that none of this genuine fraud would have been affected in any way by the voter ID legislation that Woodfill and Abbott and so many other Republicans desperately want to pass, since fraud by voter impersonation is basically unheard of. Woodfill’s concern about the potential for fraud with paper ballots is reasonable, but he and his partymates have never shown any interest in doing something about it, as they prefer instead to try to solve a “problem” that doesn’t exist. As for Birnberg, the point he’s making is that however many times you count an eSlate machine’s memory stick, you’ll always get the same answer regardless of whether or not the stick is faulty or fraudulent. This is true, but it’s also true that ballots that have been filled out manually may be counted or not depending on an election official’s interpretation of the voter’s intent. The example of certain counties in Florida in 2000, where ballots that had the Democratic box checked for President and the name “Al Gore” written in for the write-in slot were discarded because the voter had selected more than one candidate, will always serve as Exhibit A for this. Even without room for interpretation, if you have a million paper ballots to count by hand, I can just about guarantee you’ll get a different result the second and third and fourth times you count them. Having paper ballots that have been printed by a voting machine, which thus eliminates the “not filled out correctly” problem, and which can serve as a sanity check and an emergency backup in the event there are ever doubts about the integrity of a memory stick, is clearly the best situation, and it’s one I hope the next County Clerk will work towards as we start the process of buying permanent replacements for the lost eSlates. I myself don’t believe that paper ballots in the context of in-person voting are more or less likely to be susceptible to fraud than voting machine ballots are. The basic procedure for securing them, which largely boils down to “Never let any ballot be in the sole unsupervised possession of a single person”, is the same either way. As long as we can ensure that, I’ll be as confident as I can be about the integrity of the process.